Over 70 years ago, a young Chinese painter Chang Shuhong decided to leave Paris and turned to his turbulant homeland, what attracted him in particular was the albums "Les Grattes de Touen-Houang". The photos in the albums were tanken in 1907 by French explorer Paul Pelliot at the Mogao Grattoes in Dunhuang, in northwest China's Gansu Province. The album contains about 300 photos of murals and sculptures. Chang was taken aback when he saw the photos for the 1st time. 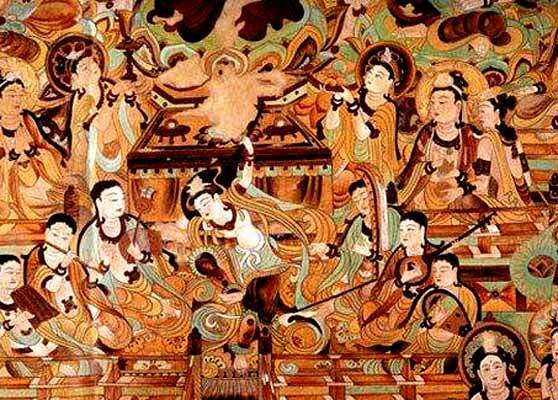 Just a glimpse at the Dunhuang murals beside the same river led 32-year-old Chang to give up his comfortable life in Paris and return to China. 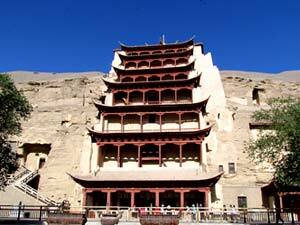 Since then, he's never left Dunhuang. 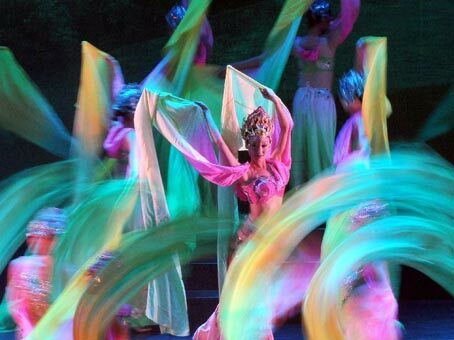 On May 23, 1979, Flowers of the Silk Road made it's premier in Lanzhou. 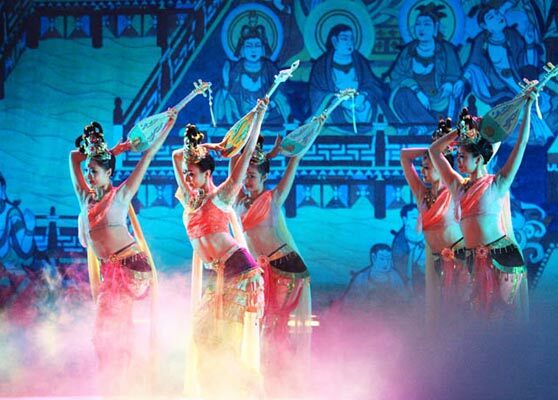 The show tells the story of a tragic life and death departure that takes place in Dunhuang during the Tang Dynasty. 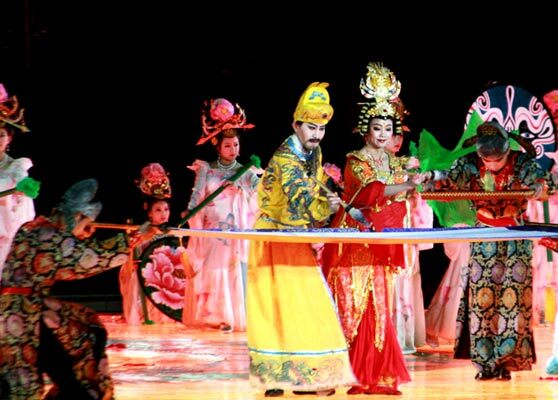 It contains many attractive characters including painter Zhang, his daughter Yingniang and a Persian merchant, Yunus. 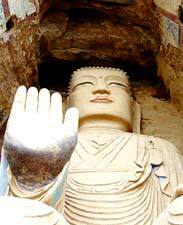 In the summer of 1900, a custodian at the Mogao Grottoes was clearing sand away in the corridor at grotto No. 16, during his break, he stumbled upon a hole of the corridor, he would never have imagined the discovery would lead to a historical treasure trove. The art of religion derives from life. 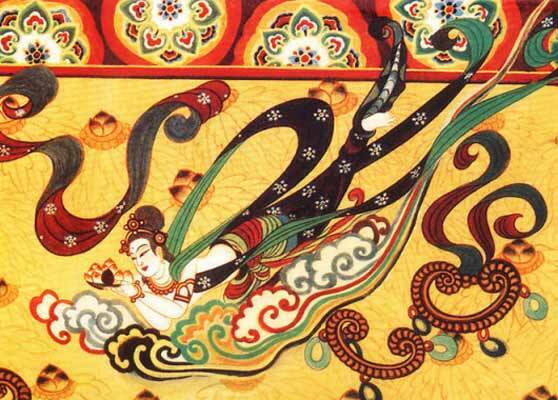 The musical dances dipected in Mogao Grottoes generally fall into two categories: hevenly dances and folk dances. Most of the grottoes have both in their murals. 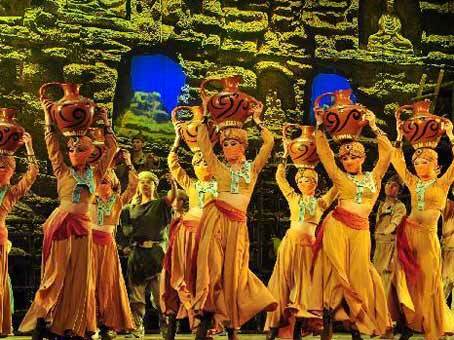 Many dances painted between the 6th and 11th century, depict specific events: banquets, weddings...and common things. Experts have been pondering for years what inspires such murals. What was fashion like over 2000 years ago? 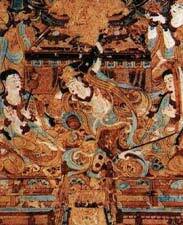 How many secrets are still waiting to be discovered in the costumes of Dunhuang? What inspiration would them provide for modern fashion designers? The ocarina is one of the oldest musical instruments in China, streching back to more than 7,000 years. 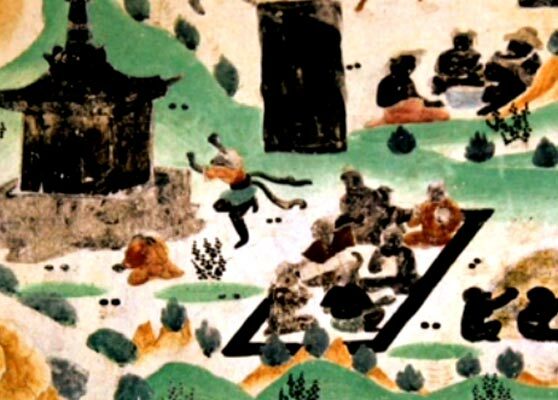 Musicians play ocarinas have been depicted in the murals of the Mogao Grattoes. The images in grattoes No. 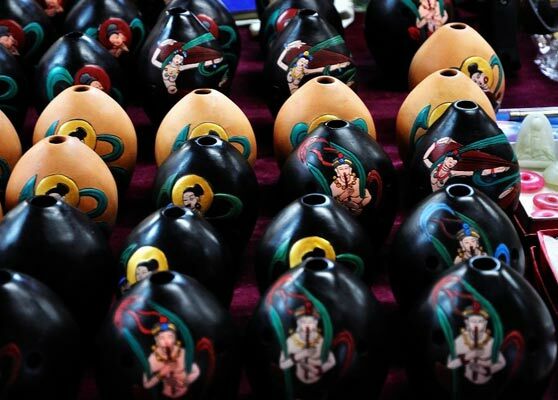 220 featurely only peach-shaped ocarina among the 4,500 musical instruments shown in the murals. It is unclear whether the instrument originated from Central Plains or was made locally. 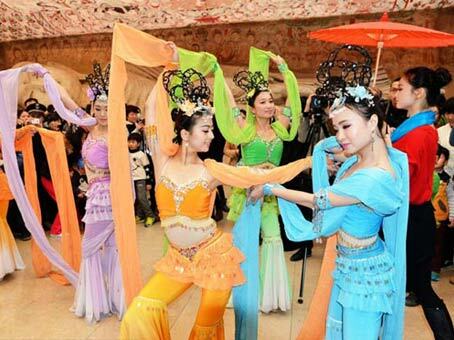 Dunhuang, a long way from Chang'an, the ancient capital, painters lit the walls of the Mogao Grottoes the scenes of the Tang court, the once popular whirling dance was able to survive in its former glory here. Grotto No. 220 was carved in 642, unlike the grottoes carved before the Tang Dynasty, it featured in three dimentional depth that depict the grand scene. It was created mor than 700 years before European s were able to paint in such a perspective. 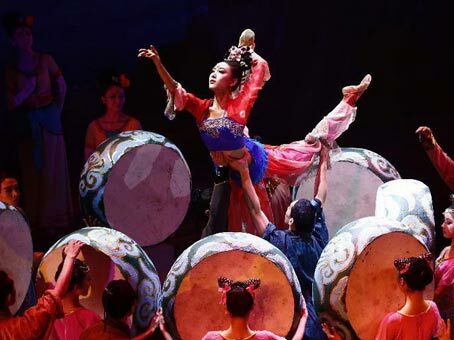 The band of 20-30 muscians and 6 dancers doing the whirling dance, creating an exotic and expressive scene. There are 39 dancers and musicians in the mural inside gratto No. 112. All were well-shaped and vivid. Grotto No. 112 contains the greatest number of murals depicting singing and dancing, and it does be nicknamed the music grotto. 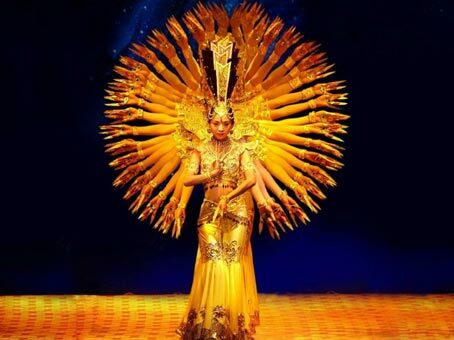 But the figure playing the pipa behind her back can't be found in any historical records, a dance move hasn't survived to the present. Was it something that came from the imagination of the Tang Dynasty painters? 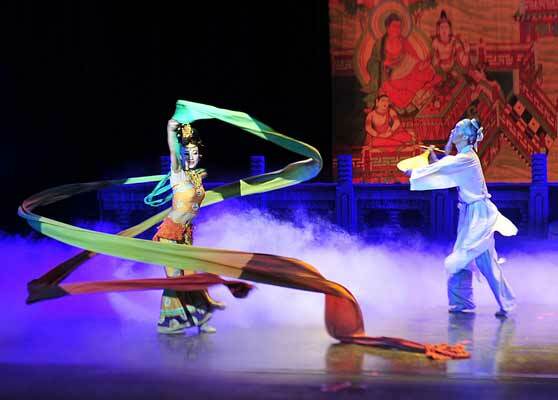 Classic dance drama "Flower Rains along Silk Road"
The Dunhuang Mogao Grottoes, also known as the One-Thousand-Buddha Grottoes, are located on the eastern, rocky side of Singing Sand Mountain, near Dunhang City, Gansu Province. 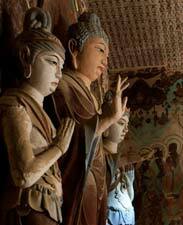 The Mogao Grottoes show examples of various types of art, such as architecture, painting and statuary. Preservationists are desperately trying to digitize the important relics before they are gone forever.